Ribbon Cutting at the Myrtle/Wyckoff Plaza! There will be a ribbon cutting for the Myrtle/Wyckoff Plaza! DOT officials will be there around 11 AM for the ribbon cutting. We've invited Councilmember Antonio Reynoso, as well as Assemblywoman Maritza Davila to join us. If you'd like to join, please don't hesitate to stop by! Street Ambassadors at the Myrtle/Wyckoff Plaza! 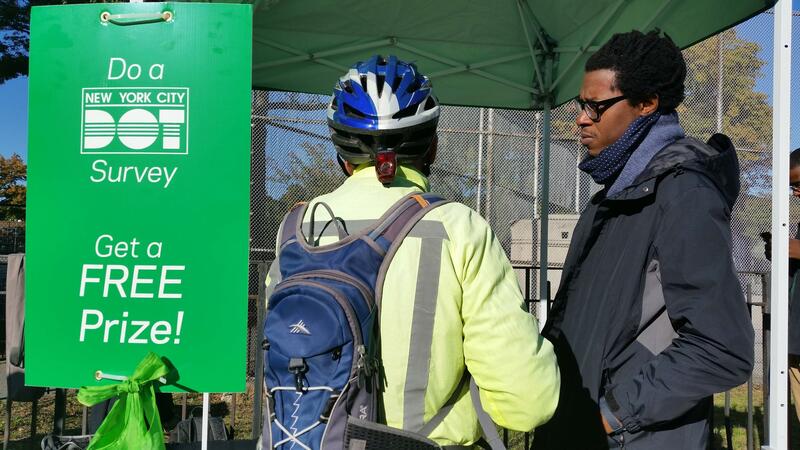 The NYC DOT Street Ambassadors wil be in the Myrtle/Wyckoff Plaza on Wednesday, November 2nd to talk to residents of the area as well as those passing by about the current state of the plaza. We will also touch upon the change from interim materials to something more permanent. There will be free giveaways for the people that stop and talk to us. Take a quick survey about Myrtle/Wyckoff and receive a cool giveaway! The NYC DOT will be presenting to Queen's Community Board 5 about the plan to convert Wyckoff Avenue, between Myrtle and Gates Aves, into a pedestrian plaza. If approved, it would turn one of the city's deadliest intersections (Myrtle, Wyckoff and Palmetto), into a safe area where those who are transferring can cross safely as well as sit down and relax. The NYC DOT presented to Brooklyn's Community Board 4 on June 15th, 2016 as this plaza straddles the border of Brooklyn and Queens. The NYC DOT will be presenting to Brooklyn's Community Board 4 about the plan to convert Wyckoff Avenue, between Myrtle and Gates Aves, into a pedestrian plaza. If approved, it would turn one of the city's deadliest intersections (Myrtle, Wyckoff and Palmetto), into a safe area where those who are transferring can cross safely as well as sit down and relax. The NYC DOT will also present to Queen's Community Board 5 on June 21st, 2016 as this plaza straddles the border of Brooklyn and Queens. The NYC DOT will be presenting to Brooklyn's Community Board 4 Transportation Committee about the plan to convert Wyckoff Avenue, between Myrtle and Gates Aves, into a pedestrian plaza. If approved, it would turn one of the city's deadliest intersections (Myrtle, Wyckoff and Palmetto), into a safe area where those who are transferring can cross safely as well as sit down and relax. The NYC DOT presented to Queens's Community Board 5 Transportation Committee on May 24th, 2016, as this plaza straddles the border of Brooklyn and Queens. The NYC DOT will be presenting to Queen's Community Board 5 Transportation Committe about the plan to convert Wyckoff Avenue, between Myrtle and Gates Aves, into a pedestrian plaza. If approved, it would turn one of the city's deadliest intersections (Myrtle, Wyckoff and Palmetto), into a safe area where those who are transferring can cross safely as well as sit down and relax. The NYC DOT will also present to Brooklyn's Community Board 4 Transportation Committee on June 6th, 2016 as this plaza straddles the border of Brooklyn and Queens. One Day Plaza! - The Street Ambassadors will be in your neighborhood! The NYC DOT will be holding a one day plaza at Wyckoff Avenue between Myrtle and Gates Aves. This will be done so the public can see what type of space Myrtle/Wyckoff can become if we transform this area into a plaza. Come by! There will be activities for all ages there. The NYC Street Ambassadors will also be at the event. They will talk a bit more about the specifics of the project, as well as be taking and feedback. Let them know if you like the idea of the plaza! If you give any feedback, you'll receive a free giveaway! The NYC DOT is proposing to enhance safety and public space at the intersection of Myrtle Ave, Wyckoff Ave and Palmetto St, where the L/M subways connect to the Ridgewood Bus Terminal. 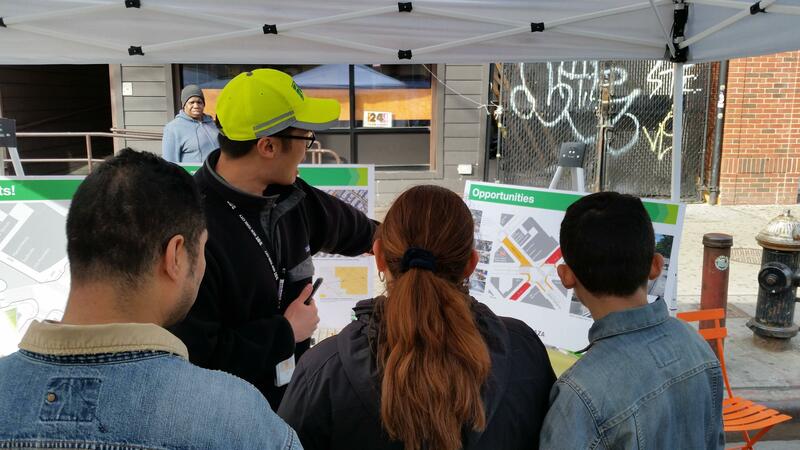 Please join us to share your input about safety and plaza design at his busy intersection where Brooklyn and Queens connect. This meeting will be held at the Bushwick School for Social Justice (400 Irving Ave) from 6:30 PM to 8 PM. For the project flyer, please click this link. 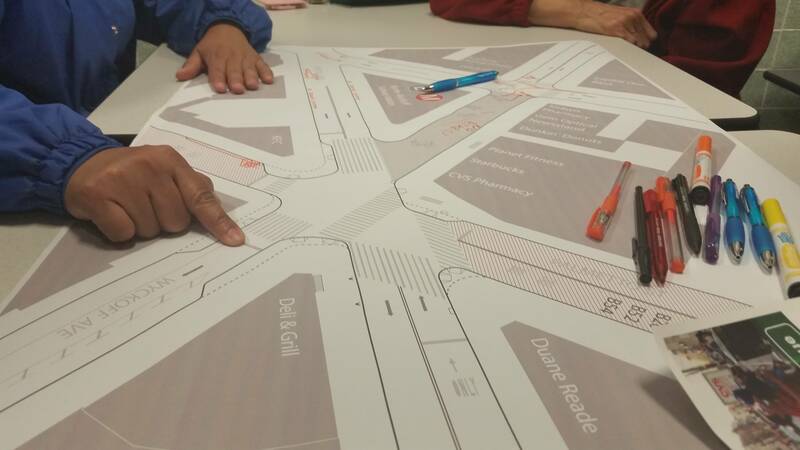 Come join the NYC DOT for a public workshop to give input about what should be in the proposed plaza (Wyckoff Ave between Myrtle and Gates Aves). The project will address the safety issues surrounding the Palmetto, Wyckoff and Myrtle junction. Please stop by! The meeting will be in the cafeteria of IS 77 (976 Seneca Ave) from 6:30 PM to 8 PM.